In November 2010 it was reported that the Vatican called in experts to study the possibility of extraterrestrial alien life and its implication for the Catholic Church. The Director of the Vatican Observatory commented that the discovery of possible alien life would have "many philosophical and theological implications" for Catholics. 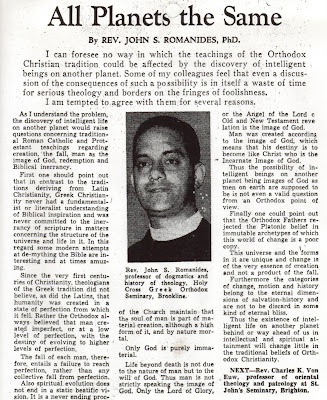 In 1965 Fr. John Romanides offered a valuable resource on this topic for a series run by the Boston Globe that explored this topic from various religious perspectives. In the fifth response of this series, he gives the unique Orthodox perspective. The full text is below. First one should point out that in contrast to the traditions deriving from Latin Christianity, Greek Christianity never had a fundamentalist or literalist understanding of Biblical inspiration and was never committed to the inerrancy of scripture in matters concerning the structure of the universe and life in it. In this regard some modern attempts at de-mything the Bible are interesting and at times amusing. This means that the interdependence and solidarity of creation and its need for redemption and perfection are seen in a different light. It is also important to bear in mind that the Greek Fathers of the Church maintain that the soul of man is part of material creation, although a high form of it, and by nature mortal. Furthermore the categories of change, motion and history belong to the eternal dimensions of salvation-history and are not to be discarded in some kind of eternal bliss.